*Serious travel warnings have been issued for Tripoli, with many foreign governments advising against travel to the Libyan capital. Travellers should note in particular that clashes have periodically forced the closure of the international airport. 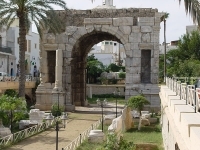 The Libyan capital of Tripoli is ordinarily filled with wonderful sights, charm and hospitality. Situated on the Mediterranean Sea in the northwest of the country, Tripoli has one of the largest harbours in North Africa; it is a city constantly abuzz with activity. The many historical sites and ruins dotted throughout the city stand testament to its rich and fascinating history. Visitors to Tripoli can stroll in the bustling bazaars, shopping for holiday souvenirs and trinkets as well as beautiful textiles and exquisite jewellery. Tourists are spoilt for choice when it comes to the amazing sights in and around the city, from the Red Castle to the Gurgi and Karamanli Mosques. Tripoli is overflowing with places to discover and sights to behold. Unfortunately, this wonderful city has seen hard times in recent years thanks to rebel and terrorist activity during and in the aftermath of civil war. While its many wonders remain undimmed, travellers are advised to do careful research before visiting the city, and to take note of the serious travel warnings issued by various international governments.